​I understood sharing in Christ’s suffering, but the meaning of the resurrection had, for some reason, escaped me. I had given it little consideration. Maybe I had focused too much on the negative – being too settled into the pain of grief and depression. Maybe darkness had become too much of who I was. Maybe I was so accustomed to it that it had become natural for me to live there. ​I came to realize that God doesn’t want us to live this way. No one should live in perpetual darkness. God promises more. And so, not long ago, having come through a long season of pain, I decided I needed to learn what this resurrection could mean for me. I realized I needed to come out of the winter I’d lived in for so long. ​Jesus, through His death and rising, has given us a new promise for life. He has forgiven us – set us free. It’s a setting aside of all that is painful. It’s to be transformed and start clean. It’s to find joy again. ​Resurrection is how Spring follows Winter. ​It’s like taking our eyes off the ground and turning them upward to see the skies and the sun. 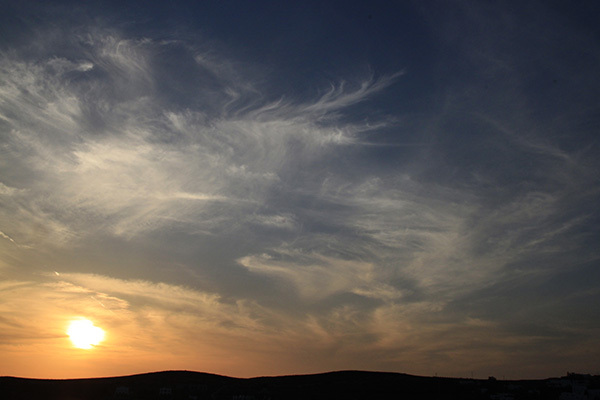 It’s taking note of the clouds and how they move, minute by minute changing – from stormy to puffy to wispy. It’s to be aware of how the sun bathes the world with its light and thanking God for His miracles. ​Resurrection is like the transformation that follows when the sun shines its warmth on the bud, opening it petal by petal, releasing it from darkness. Gradually a flower shows its beauty to a world that has been longing to see color again. Resurrection is like a butterfly spreading its wings – transformed – entering the world and discovering what it holds for her. She has found freedom, the likes of which she had never imagined. After a long cocooning, she learns what she was made for. ​And, so can we. We too can leave the dark behind and find transformation. We too can find a new way to be.